Dotted across Vvardenfell are many curious ruins: ancient Dwemer fortresses still clank and hum, awaiting the return of their long lost masters; abandoned shrines to the Daedric princes, built long ago by Daedra and worshiped by ancient Chimer, attract dangerous worshipers to this day; but of all these ruins and remnants, ancient Dunmer strongholds remain the greatest mystery. These ominous monoliths are monuments to an age long gone, of which few records exist. Dunmer strongholds are reluctant to give up their secrets, defying attempts at exploration and restoration. Many adventurers have been lost in their labyrinths, filled with cults, daedra, and bandits. The question remains, who built these great structures and why? When were they constructed? Studies remain inconclusive, but theories abound. Andasreth: Located near the coast, due west of Ald’ruhn, it lies in a pocket of mountains in the West Gash. It can be found by navigating the road northwest of Caldera. Berandus: Northwest of Adasreth, near the West Gash coast, it is located southeast of Gnisis. Falasmaryon: This stronghold lies deep in the northern Ashlands and south of Valenvaryon. Falenarano: This stronghold is located on the southernmost tip of the Grazelands, near the border of Molag Amur. Hlomaren: This stronghold lies west of Balmora, along the Bitter Coast. Indoranyon: This stronghold is located along Azura’s coast and the eastern border of the Grazelands. Marandus: Sitting on the shore of Lake Nabia, in Molag Amur, it can be accessed by waterway from Suran. 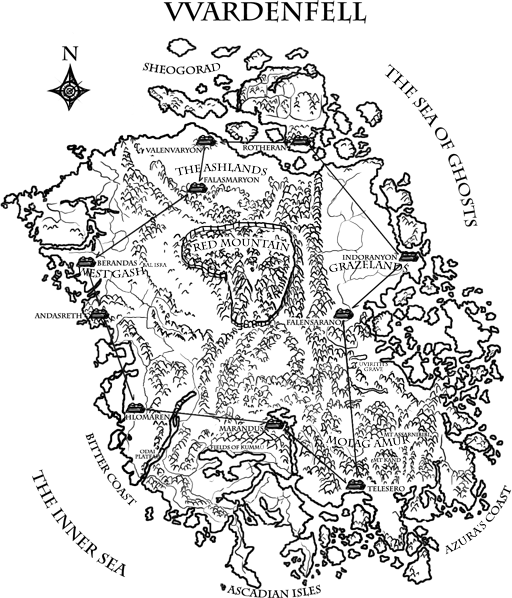 Rotheran: This stronghold is located in Sheogorad, on the southernmost tip of the isle of Dagon Fel. Telasero: This stronghold lies on the southern coast of Molag Amur, between Suran and Molag Mar. Valenvaryon: This stronghold is located in the Ashlands, on the northernmost edge of the coast. The Dunmer have no records of stronghold construction, but the architectural style has similarities to the High Velothi period. The strongholds exist side-by-side with ancient Velothi towers, attributed to the Chimer during the High Velothi period. The Tribunal Temple still employs this architectural style to this day. The Dunmer strongholds however, show a marked divergence from High Velothi architecture. They are grander, starker, more geometric in design, and far more difficult to penetrate. Explorers who have survived probing their interiors have reported that they contain many levels, each one with grand hallways and hundreds of rooms. The top level is flat and perfectly positioned for archers. Its walls slope steeply and are well fortified with thousands of tons of perfectly cut stone. The entrance doors are heavy, and force intruders to navigate long passageways before entering the stronghold’s larger interior domains. The architectural style of the strongholds seems to betray a more military mindset compared to the lighter and brighter High Velothi period. If you look at the current inhabitants of these structures, you may note that typically lone wizards and magicians prefer to occupy Velothi towers; whereas people who occupy Dunmer strongholds band in groups, out of a need to defend themselves and remain hidden. Of all the Great Houses of the Dunmer, only the Redoran have made attempts to reclaim the ancient strongholds. The Telvanni have been keen to adopt ancient Velothi towers as their homes, and the Hlaalu are content to build anew. Perhaps only these proud warriors see the strategic benefit of capturing them, or see it as a way to restore glory to the Dunmer. It is rumored that a group of Redoran warriors have made efforts to reclaim Marandus and Andasreth in an effort to expand their influence; it is not yet known whether their efforts have been successful. It is a great shame that the Tribunal Temple allows these structures to lie in ruin, as veritable nests of dissent and danger. Perhaps they will reclaim them as they repopulate Vvardenfell, after abandoning it so long ago. The earliest records of Dunmer strongholds come from the First Era, detailing the unification of the Dwemer and Chimer, who drove the Nords out of Morrowind in the fifth century, and up to the War of the First Council. For example, Dagoth Ur was the supposed ruler of the lost stronghold Kogoruhn. It is likely the other leaders of the First Council held their own strongholds. Some scholars have proposed that this marks the time of their construction, built for the sole purpose of keeping the Dwemer in check and opposing the Nord invasion. The Chimer had enough political organization to conduct such a massive undertaking in this period, whereas Dunmer lacked the required organization and manpower in later eras. However, the question remains what came first, the First Council or the strongholds? Whether or not these massive structures were constructed in a mere century remains a mystery to scholars. However, we can theorize on what they were used for during this period. Dunmer strongholds are more suitable garrisons than ancient Velothi architecture. They are death traps under the guard of a few bandits. Paired with an organized military, they would prove impenetrable. Many strongholds are strategically placed along Vvardenfell’s coast. Scholars have argued whether the strongholds were constructed to repel Nords or keep the Dwemer in check. Placement along the coast would allow the Chimer to repel Nordic invaders from sea. Most strongholds lie on the northern and western coasts, where Nords were most likely to invade, and fewer built in the east and south. However, the strongholds tend to be far apart. Each stronghold would have to have its own army to defend it, and perhaps did, but what makes them truly strategically viable is its teleportation system, known as propylons. The Propylon chambers are the Chimer’s greatest feat of magical engineering. Each chamber contains two propylons, set to teleport someone to a propylon chamber in another stronghold. These propylons are chained so travelers can jump from chamber to chamber until they reach the correct stronghold. The propylon chain circumnavigates the strongholds around the island (see map). The propylons require an index: a magical key that looks like a small, roughly hewn, oblong gemstone. Each index is keyed to a specific propylon, requiring a full set of indexes to jump from one propylon chamber to another in a complete circle. The propylon chamber lies in a separate structure on top of the stronghold, so navigating the stronghold itself is unnecessary when using the teleportation system. The Chimer likely used these propylons to move troops from one location to another, thus requiring less manpower to defend each stronghold against the Nords. This form of teleportation would also politically unify the Chimer by making it easier for the First Council to organize. All ten known strongholds are connected, leaving the lost stronghold Kogoruhn out of the loop. The Dunmer must have still known how to engineer propylons during the Battle of Red Moutain, resetting the propylon chambers to exclude the stronghold of Dagoth Ur. The propylons requiring an index to function means the lord of a stronghold had the power to prevent unwanted factions from entering, and others to pass unhindered. It is an open, yet controlled travel system. Most propylon indexes are lost. Hopefully at least one index for each propylon still exists, scattered throughout Vvardenfell. Until these indexes are recovered, it is unlikely any large scale attempt will be made to repopulate the strongholds. Restoring the propylon network would create new avenues of travel, opening up new areas of exploration and colonization. These great strongholds have long awaited its people to return and reclaim them. They are a testament to the once glorious Chimer, yet remain a forgotten piece of Dunmer heritage. They have the potential to become great cities, and unify, not just the Dunmer, but all people of the Empire living in Vvardenfell.